Davidson College is a private liberal arts college in Davidson, North Carolina with a historic 665-acre main campus and a 110-acre lake campus on Lake Norman. The college has graduated 23 Rhodes Scholars. Davidson annually enrolls about 1950 students from 47 states and 40 countries. Of those students, nearly 80 percent study abroad and about 25 percent participate in 19 NCAA Division I sports. Students may choose from 26 majors and 17 interdisciplinary minors, as well as other interdisciplinary studies. The college is governed by an honor code and the majority of students, about 93 percent, live on campus for all four years. Princeton Review and U.S. News & World Report regard Davidson's admission process as "most selective". For the class of 2022 (enrolled fall 2018), Davidson received 5,712 applications and accepted 1,104 (19.3%). The yield rate (the percentage of accepted students who enroll) was 46.8%, and 85% of accepted freshmen reporting rank were in the top 10% of their high school classes. The middle 50% range of SAT scores for admitted students was 640–720 for the new Evidence-Based Reading & Writing, and 650–730 for Math, while the ACT Composite range was 29–33. Caucasians represented 67.1% of the incoming class, and 44.5% of enrolled freshmen were from the South. The 2019 annual ranking by U.S. News & World Report rates Davidson College as the 10th best among "National Liberal Arts Colleges" in America, and 3rd in "Best Undergraduate Teaching" in the nation. For 2016, Davidson College was ranked 25th overall on Forbes ' list of "America's Top Colleges," and 1st in the South. In 2018, Kiplinger's Personal Finance rated Davidson College as the #1 best college for value across all colleges and universities in America. An institution of higher learning of The Presbyterian Church USA, Davidson College was founded in 1837 by The Concord Presbytery after purchasing 469 acres (1.90 km2) of land from William Lee Davidson II. He was the son of Revolutionary War commander Brigadier General William Lee Davidson, for whom the college is named. Church records show a meeting on May 13, 1835, among subsequent meetings, by members of the Concord Presbytery making plans to purchase and perform initial construction on the land, with land payments starting Jan. 1 of the following year. The first students graduated from Davidson in 1840 and received diplomas with the newly created college seal designed by Peter Stuart Ney, who is believed by some to be Napoleon's Marshal Ney. In the 1850s, Davidson overcame financial difficulty by instituting "The Scholarship Plan," a program that allowed Davidson hopefuls to purchase a scholarship for $100, which could be redeemed in exchange for full tuition to Davidson until the 1870s. The college's financial situation improved dramatically in 1856 with a $250,000 donation by Maxwell Chambers, making Davidson the wealthiest college south of Princeton. The Chambers Building was erected to commemorate this gift. On November 28, 1921, the Chambers Building was destroyed in a fire but was reconstructed eight years later with funds provided by a generous gift from the Rockefeller family. The Chambers Building continues to be the primary academic building on campus. In 1923, the Gamma chapter in North Carolina of Phi Beta Kappa was established at Davidson. Over 1500 men and 500 women have been initiated into Davidson's chapter of Phi Beta Kappa. In 1924, James Duke formed the Duke Endowment, which has provided millions of dollars to the college, including a $15 million pledge in 2007 to assist with the elimination of student loans. On May 5, 1972, the trustees voted to allow women to enroll at Davidson as degree students for the first time. Women had attended classes as early as the 1860s but did not enjoy degree privileges. The first women to attend classes at Davidson were the five daughters of its president, the Rev. John Lycan Kirkpatrick. The first women were permitted to attend classes to increase the size of the student body during the American Civil War. However, art major Marianna "Missy" Woodward became the first woman to graduate from Davidson. She graduated in 1973 and was the only woman in a class of 217. In early 2005, the College's Board of Trustees voted in a 31–5 decision to allow 20% of the board to be non-Christian. John Belk, the former mayor of Charlotte and one of the heirs of Belk Department Store, resigned in protest after more than six decades of affiliation with the college. Belk, however, continued his strong relationship with his alma mater and was honored in March 2006 at the Tenth Anniversary Celebration of the Belk Scholarship. In 2007, Davidson eliminated the need for students to take out loans to pay for their tuition. All demonstrated need is met through grants, student employment, and parental contribution. The college claims to be the first liberal arts college in the United States to do this. According to The Princeton Review, Davidson is ranked among the top twenty colleges nationally for the following categories: "Best Overall Academic Experience For Undergraduates," "Professors Get High Marks" (1st), "Professors Make Themselves Accessible" (16th), "Students Study the Most" (10th), "School Runs Like Butter" (4th), "Town-Gown Relations are Great" (3rd), "Easiest Campus to Get Around" (3rd), and "Best Quality of Life (16th)." Davidson has a student-faculty ratio of 10:1, 89% of its classes are under 30 students, and no classes have more than 50 students. Davidson has 170 full-time faculty members. Almost all faculty members have terminal degrees in their field, with 96% of full-time members holding PhDs. Davidson students are bound by a strict honor code, signed by each student at the start of their Freshman year. The Davidson College Honor Code states: "Every student shall be honor bound to refrain from cheating (including plagiarism). Every student shall be honor bound to refrain from stealing. Every student shall be honor bound to refrain from lying about College business. Every student shall be honor bound to report immediately all violations of the Honor Code of which the student has first-hand knowledge; failure to do so shall be a violation of the Honor Code. Every student found guilty of a violation shall ordinarily be dismissed from the College. Every member of the College community is expected to be familiar with the operation of the Honor Code." As one of the most obvious manifestations of the Honor Code, Davidson students take self-scheduled, unproctored final exams. Some exams (known as "reviews" in Davidson vernacular) are take-home, timed, and closed book. Other take-home exams may be open book or untimed. Often take-home exams may take students days to complete. Every assignment submitted at Davidson includes either an implicit or (more often) explicit pledge that the student neither gave nor received assistance on the assignment beyond the bounds of the Honor Code. The Honor Code extends beyond 'reviews,' essays, or research papers. Notes around campus are commonly seen, whether on a bulletin board or taped to a brick walkway, describing an item found at the location and the finder's contact information so that the property may be recovered. Davidson offers majors in 27 subject areas. Students can also design their own major through the Center for Interdisciplinary Studies. In addition to the one major required for graduation, students may pursue a second major, a minor, or a concentration. 17 Interdisciplinary concentrations are offered in Archaeology, Applied Mathematics, Asian Studies, Biochemistry, Computer Science, Education, Environmental Studies, Ethnic Studies, Film and Media, Genomics, International Studies, Medical Humanities and Neuroscience. In February 2002, the Royal Shakespeare Company opened on campus the Duke Family Performance Hall, one of the premier performance spaces in the Southeast. In 2007 and 2008, the Cunningham Fine Arts building, home to several smaller performance spaces, faculty offices, classrooms and set construction facilities, was completely renovated. Davidson's former President, Tom Ross, has repeatedly credited Davidson's Classics Abroad program with redirecting his life. Begun by Professor George Labban in the 1960s, the program has survived the retirement of Labban and his successor Dirk French. Presently, it is the most popular of the college's study abroad programs, along with the Semester in India program. Davidson students may also take advantage of the wealth of outside study abroad programs available, applying their Davidson financial aid package to their program of choice. Davidson competes at the NCAA Division I level in 19 sports. Of these sports, 10 are men's and 9 are women's. Approximately 24% of the Davidson on-campus student body participates in varsity sports. Davidson has the fourth-smallest undergraduate enrollment of any school in Division I football, behind Presbyterian, VMI (Virginia Military Institute), and Wofford (smallest to largest). Davidson's sports teams are known as the Wildcats. Their colors are red and black, although since 2008, many sports including football, men's basketball, and men's soccer have moved towards a brighter hue of red and white. The Wildcats participate as a member of the Atlantic 10 Conference in all sports other than football and wrestling. Sports that compete in other conferences include football in Division I Football Championship Subdivision Pioneer Football League, and wrestling in the Southern Conference. The main student newspaper on campus is the Davidsonian, which is published weekly. The Davidsonian was founded in 1914 and has published a volume every year since then. In 2007, Davidson's Library completed a project to digitally archive all past issues of the Davidsonian. Davidson offers over 150 student organizations on campus, including arts & culture organizations, performance groups, sports groups, political organizations, gender and sexuality groups, religious organizations, and social action groups. The Student Activities Office encourages and is available for students wishing to develop an organization not yet established at Davidson. Most student events are sponsored by the Union Board, the student organization in charge of the student union. In addition to hosting concerts throughout the Fall and Spring semesters, the Union Board organizes events such as pancake breakfasts at midnight, movies, and Freshmen welcome events. Davidson has five a cappella singing groups: the Generals, the Delilahs, Androgyny, Deez Notes, and the Nuances. The Davidson Generals, an all-male group, took first place in the "Rockin' the Forest" intercollegiate a cappella competition at Wake Forest University in 2005. Following the release of their third CD, "Alpha-Kappa-Pella" in 2006 they were selected for the Voices Only 2006 collegiate a cappella compilation CD with their cover of John Legend's "Used 2 Love U." They released their fourth album, titled "General Consensus," in the Spring of 2008, their fifth album, "Decorated" in Spring 2010, and most recently "Outlaws" in the Spring of 2014. The Davidson Delilahs, an all-female group, have produced five albums to date: "Falling into Place" (2001); "Head over Heels" (2004); "Kickin' Off our Heels" (2006); "Davidson Delilahs" (2008); and "Small Town, Big Voices" (2011). The Delilahs also perform regularly throughout the year. In 1998 Davidson Androgyny was created as a response to the absence of a co-ed a cappella group on campus. Androgyny has released four albums, "Everything But The Piano" (2001), "The A Capocalypse" (2003), "A Class Act" (2008), and their latest album "iCapella" in spring 2011. The group also sang "I'm Yours" with platinum recording artist Jason Mraz on his "Music, Magic, and Make Peace Tour" stop at Davidson College on April 19, 2008. Deez Notes is more of a comedic group as they are built on fun and love for the arts rather than musical talent. The Davidson Nuances, a co-ed a cappella group on campus, was organized in 2009. In addition to performing on campus and in the community, the group released its debut album "Shaken, Not Stirred" in spring 2012. The fraternity and eating house system at Davidson is known as Patterson Court and is governed by the Patterson Court Council. Sigma Phi Epsilon, Kappa Alpha Order, Phi Gamma Delta, Connor House, Phi Delta Theta, Sigma Alpha Epsilon, Warner Hall, Kappa Sigma, Black Student Coalition, Rusk House, and Turner House all currently occupy houses on Patterson Court. Additionally, Kappa Alpha Psi, Alpha Phi Alpha, Alpha Kappa Alpha, and Delta Sigma Theta maintain a presence on campus. The NPHC sorority Alpha Kappa Alpha was the first sorority of Davidson College's social community, receiving its charter in the Fall of 2008. The NPHC sorority Delta Sigma Theta is the newest member to Davidson's Patterson Court, having received its charter in the Spring of 2011. In total, there are eight national fraternities, four local women's eating houses, and two sororities on campus. Approximately 55% of the female students and 35% of male students belong to a fraternity or an eating house. The College Farm offers fresh, naturally grown, local produce to Davidson College students through the college's Dining Services operation. The farm is a stand-alone, business-based unit of the college and does not introduce additional costs to Dining Services. Vail Commons – The on-campus dining hall. Patterson Court – The area where the fraternities and eating houses are located. In 2002, the Royal Shakespeare Company performed William Shakespeare's The Merchant of Venice in residency at Davidson College, the RSC's second residency at a US college or university. The performance inaugurated the Duke Family Performance Hall. In March 2005, the RSC returned to Davidson and was in residency for most of the month, performing The Two Gentlemen of Verona and Julius Caesar by William Shakespeare, as well as numerous educational activities, many of which were open to the general public. In February 2006, their artists directed scenes from Shakespeare's plays and other theatrical materials inspired by Shakespeare, entitled For Every Passion, Something, with Davidson students as actors. The productions Infinite Variety and For Every Passion Something were presented at the Edinburgh Festival Fringe in Edinburgh, Scotland. In February 2007, the Royal Shakespeare Company performed Shakespeare's Pericles and The Winter's Tale, as well as Roy Williams's Days of Significance, in the Duke Family Performance Hall. In 2008, the RSC conducted educational programs, similar to those they presented in 2006. Also during this residency, playwright Rona Munro developed a new play, Little Eagles. On 19 March 2007, Davidson College announced that all students would have their demonstrated financial need met by grants and student employment; loans would no longer be a component of any Davidson financial aid package. On 7 June 2007, the Duke Endowment pledged $15,000,000 to support the initiative. In March 2008, the initiative was named The Davidson Trust. In addition to not including loans in their financial aid packages, Davidson recently completed a capital campaign adding 156 new scholarships funded with $88 million. Davidson states that they are committed to providing 100% of demonstrated need of all students, with 44% of students receiving need-based aid and over 50% receiving some form of financial aid. ^ "Fast Facts". Davidson College. 2018. ^ a b c d e "Fast Facts - Davidson College". Davidson.edu. 2016-06-30. Retrieved 2016-07-12. ^ "Colors - Marketing Toolbox - Davidson College". Marketing-toolbox.davidson.edu. Retrieved 2016-04-10. ^ member center. "NAICU - Member Directory". Naicu.edu. Archived from the original on 2015-11-09. Retrieved 2016-09-10. ^ "Davidson College | Best College | US News". colleges.usnews.rankingsandreviews.com. Retrieved 2015-12-23. ^ "Rhodes Scholarships - Number of Winners by Institution - U.S. Rhodes Scholars 1904-2016" (PDF). The Rhodes Trust. Retrieved May 23, 2016. ^ "Davidson College | Admissions, Average Test Scores & Tuition | The Princeton Review". Princetonreview.com. Retrieved 2015-12-23. ^ "Fast Facts". Davidson.edu. Retrieved 2015-12-23. ^ "Davidson Wildcats 'Playing to Win' plan, released 2015" (PDF). ^ a b "Davidson College | Admissions, Average Test Scores & Tuition | The Princeton Review". Princetonreview.com. Retrieved 2015-12-23. ^ "Majors & Programs". Davidson.edu. Retrieved 2015-12-23. ^ "Honor Code". Davidson.edu. Retrieved 2015-12-23. ^ "Davidson College | Best College | US News". Colleges.usnews.rankingsandreviews.com. Retrieved 2014-08-17. ^ a b c d e f g h i j "Class of 2021 Profile". Davidson College. ^ "National Liberal Arts Colleges Rankings". U.S. News & World Report. 2015. ^ "Kiplinger's Best College Values". www.kiplinger.com. Retrieved 2017-07-17. ^ "Welcome to the Davidson Historical Society". Davidson Historical Society. Retrieved November 8, 2018. ^ "Peter Stuart Ney". Davidson Encyclopedia. Davidson College. Retrieved December 25, 2015. ^ "Davidson College Timeline". Archived from the original on 2007-09-29. Retrieved 2007-07-16. ^ "Davidson College". Retrieved 19 September 2014. ^ "Coeducation". Archived from the original on 2006-09-09. Retrieved 2007-07-16. ^ "Davidson Athletics". Archived from the original on 2006-10-06. Retrieved 2006-09-23. ^ "Photographic image". Media.scout.com. Archived from the original (JPG) on 2016-03-04. Retrieved 2016-09-10. ^ "Photographic image" (JPG). Grfx.cstv.com. Retrieved 2016-09-10. ^ "2009 Georgia Southern". DavidsonPhotos.com. Retrieved 2014-08-17. ^ "Davidson College - Davidson Football Falls To Marist In Season Finale, 14-6". Davidsonwildcats.com. Retrieved 2014-08-17. ^ "Davidson College - Davidson College to Join Atlantic 10 Conference". Davidsonwildcats.com. 2014-07-01. Retrieved 2014-08-17. ^ "The Davidsonian". Archived from the original on 2006-09-04. Retrieved 2006-09-23. ^ "The Davidsonian Digitized". Retrieved 19 September 2014. ^ "Student Activities - Davidson College". Davidson.edu. Retrieved 2016-04-10. ^ "Generals News". Archived from the original on 2008-07-05. Retrieved 2008-08-05. ^ "RARB Review of The Davidson Generals – Alpha Kappa Pella". 6 June 2006. Retrieved 19 September 2014. ^ "Voices Only 2006 A Cappella Compilation CD Album Buy Now". Archived from the original on 2008-09-15. Retrieved 2008-08-05. ^ "Delilahs Release CD". Archived from the original on 2006-09-16. Retrieved 2008-08-05. ^ "Androgyny". Davidson Androgyny. Retrieved 19 September 2014. ^ "The Nuances". Archived from the original on 2011-08-30. Retrieved 2012-03-14. ^ "Davidson College - Patterson Court". Archived from the original on 2006-10-06. Retrieved 2006-09-23. ^ "The Royal Shakespeare Company (RSC)". Retrieved 19 September 2014. ^ "Davidson College – 2008 RSC Residency". Retrieved 19 September 2014. ^ "College News & Events". Archived from the original on 2007-02-11. Retrieved 2007-05-26. ^ a b "Davidson College – A Word on Affordability". Retrieved 19 September 2014. 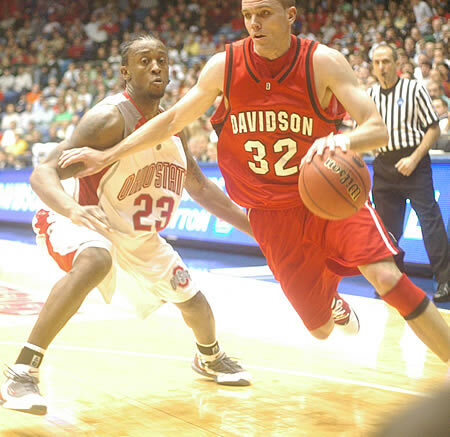 ^ "Davidson's Stephen Curry will enter NBA Draft". The Staten Island Advance. AP. April 23, 2009. Retrieved January 18, 2013. ^ Ganesh, Janan (2012-10-07). "The dandy with a will of iron: He was a Madonna fan and would be Oscar Wilde. But, as a new biography reveals, George Osborne ALWAYS had his eye fixed on power | Daily Mail Online". Dailymail.co.uk. Retrieved 2016-04-10. ^ Whitney, Craig R. (September 26, 1976). "German Professor Campaigns in Ruhr". New York Times. Retrieved 2018-05-19. Wikimedia Commons has media related to Davidson College.